The Bobster Bugeye includes open cell sweat absorbing foam around the frame for ultimate protection. A vented, flexible plastic frame encloses polycarbonate lenses and is low profile enough to fit under a helmet. I ordered these expecting that they would not work well with my helmet. I use a bitwell bonanza XS open face and these goggles are perfect. My bike is naked and at higher speeds my eyes feel fully protected. I rode in 90 plus temps and they never felt overheated. 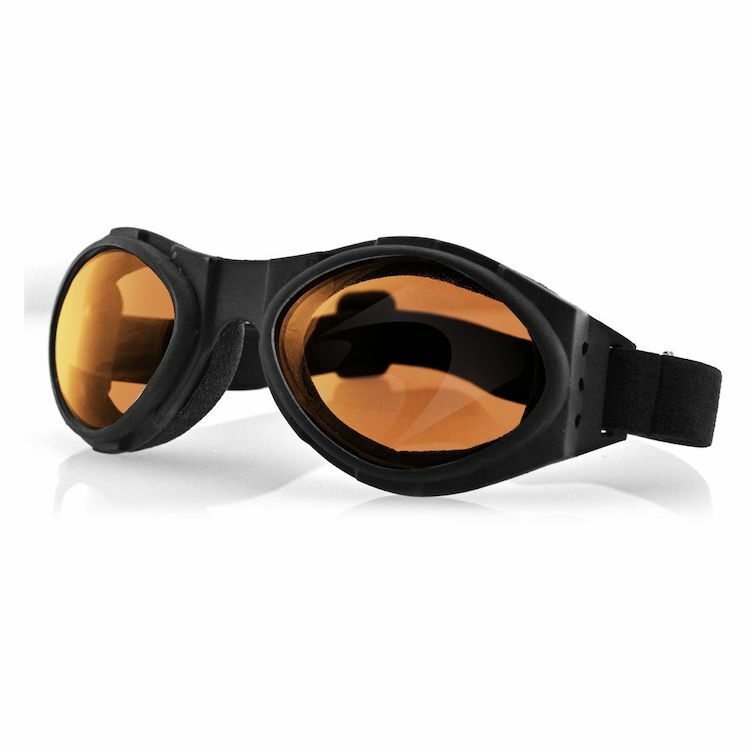 You won't be disappointed in these goggles and are a great bargain for the price. these may leak some air in. hasn't been to much a problem. you are buying a low priced item so i wouldn't expect top notch protection. they look good. The tints are very dark! LIke when I pull into the parking garage I cant see very well! But they do the job during sunny days. They look like sunglasses and seal well. I bought them to use with by Bell 500---they dopush against the bridge of my nose but I haven't seen goggles that dont do that yet. Fit well black the wind. I got the clear ones use them at night mostly. They also seem to cut down on headlight glare from oncoming cars. About what you would expect for the price. I bought them as a spare pair to leave with the bike. I would expect them to last one season. Not bad, especially for the price. Not bad, you can definitely see how they offer it at such a low price, but that's to be expected for such an inexpensive goggle. It fits well, and does the job. Keeps the right amount of air out. Bobster is a great brand. Since I was no longer wearing a full face helmet, I needed something to protect my eyes for when I went riding with my half-helmet. Bought them as a Christmas gift for my brother in law. Needed a night-riding pair of goggles. Great steal at the price. I've wanted to try goggles for a while and the price was low enough for a trial run. I have had a number of Bobster goggles and sunglasses, They have always performed well. I picked up a half-helmet for passengers and myself when, I want to leisurely ride and needed good eye protection for on the go. Love the feel, not intrusive or an uncomfortable fit at all. Style wise they are cool and I especially like the orange tint. When wearing the Zan's neoprene full face mask, sunglasses dont fit properly. They fog if you wear it inside the mask and the arms dont secure around your head outside of the mask.